This is the one I'd most looked forward to. My second one, a year after my first, and this time with some proper coaching and more informed planning. I was excited about my prospects for a PB , and also about the venue. Recent history has seen wall to wall sunshine, the course is reckoned to have one of the most stunning (as well as being the most demanding) bike legs of the Ironman races, and a flat run. Nice... ha ha... hmmm. It didn't disappoint. The day began warm and I broke into a sweat on the 5am walk down to transition. I was only wearing a thin shirt, and trying not to think about how hot it might be by the time we got into the hills. That being said, I'd rather be hot than cold, and I'd stuck a couple of bottles of factor-50 into my transition bags - 'Be Prepared', should be the motto for any race (yes, I was a boy scout). There's no excuse for problems that occur because you've cut a corner somewhere or not checked out the conditions of the day. If it's in your bag you can use it or not, but at least you have the choice. Transition was full of nervous tension as is normal, and the pre-race routine took over - nutrition, check; hydration, check; brakes, check; spare tubes and CO2 canisters with adaptor, check; walk away and don't think about your bike anymore. Thankfully I also seem to have my body sorted so that I don't have to queue for the portaloos before the race - I recommend a strong coffee after breakfast, before you leave the hotel... works a charm every time! The mood-setting music blaring from speakers I've only ever seen at large stadium rock concerts was a little harsh on the ears but at least my body was now vibrating as a result of something other than an adrenalin-amplified heart rate! A quick hug from my parents and a good friend of mine who happened to be working in Nice that weekend, and it's on with business. It's a strange time of the day to see people you know. The nerves and the constant repetition of the race plan in my head (I'm sure this sport encourages OCD tendencies!) make it hard to focus on anything else and the moments when you want your supporters to know you're happy to see them, I'm sure I probably just seem a bit detached. It's great to know they're there and I know I'll be even happier to see them later when it gets really tough. 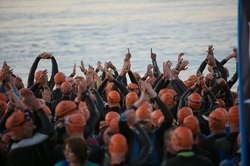 I prefer a beach start to deep water which is just as well as this was a somewhat daunting starting line with over 2300 athletes lining up, the largest field at an Ironman event to date. The sea was clear, calm and warm... I don't remember hearing the gun, just feeling the surge around me and fighting for some space in the water for the first couple of minutes. Surprisingly though, the swim wasn't the chaotic brawl it could have been. Maybe I was lucky, but I managed to stay fairly un-crowded all the way around and enjoyed watching some football-sized jelly fish pulsating along leisurely underneath the seething mass of foam and thrashing limbs above. I was also about to dive for treasure at one point before realising that the shiny gold thing on the sea floor, was in fact an underwater cameraman with a big light - I resisted the urge to wave. Swim went to plan, with a new PB of a few seconds, and a larger than usual (I would find out later in the shower) wet suit burn on my neck... salt water. Made my way through the longest transition ever - felt like a mile at least! I wobbled onto my bike as I missed my shoes which weren't attached to the pedals as well as they could have been, and rolled out west, onto the Promenade des Anglais. The first and consequently last 10km are pan flat which allows you some time to get settled on the bike and find a rhythm, rehydrate and psychologically prepare yourself for the climbs ahead, the first one being a short but very sharp 12-15% depending on who you ask! Once my heart had returned from somewhere between my ears and the gradient dropped to a gentler 3-4% I started to enjoy the views. That's the great thing about long steady climbs is that you don't have to concentrate so hard on where you're going and can allow your eyes to wander from you handlebars to the mountains across the valley - it takes your mind off the pain somewhat and on this longest of days, that's vital. Also encouraging, was overtaking (if only for a very short time!) some of the female pros. Cresting the longest ascent of the course - over 21km long - I paused to check my brakes as I'd had trouble keeping them aligned in the days prior, before settling in for the looooooong way down. I loved the descending. Having spent a week frightening myself on a training camp in the Pyrenees earlier in the year, I'd got a new found confidence in my abilities and enjoyed passing a lot of the more nervous descenders. On an out-and-back section part way down was where I saw the first of my BRAT (Birmingham Running and Triathlon) club mates, Jon about 12 mins ahead, and a couple more, Tauny and Asker, behind by a little less. I'd passed Debbie right at the beginning of the bike which is becoming the norm as she generally beats us all (and sometimes all the other age groupers too!) out of the water. I don't think I ever narrowed the gap on Jon, and Asker was to catch me about 10km before T2, much later (to my satisfaction) than I expected. We exchanged some mutual encouragement in the tent and then (largely due to him being off-form!) I ran past him and into the heat... well over 30 degrees centigrade by now, and not a tree or parasol in sight to cast a shadow in the right direction! First half went to plan, running 1hr 40 for 13 miles, but then the heat started to take its toll. I was drinking at every aid station but to be properly hydrated in these conditions would have been practically impossible, the energy was waning and as I slowed to walk an aid station, it was mind games from here on in. On lap 3 I walked every aid station... and a bit more, and needed every bit of encouragement from the crowd to start running again. Somehow, as the time ticked on and I could see my pre-race goal slipping by, I gave myself a kick and got moving again. Last lap. Just once more. Still drinking, and making sure I got a soaking from every available hose pipe, I squelched my way around the last 10km. With every mile marker passed I found a little more energy and, as I turned into the last 5km, a PB was still possible. That was all I needed to know and now, used to the dull ache up both legs and stiffness in the neck and shoulders, I could put it all out of my mind and take another positive from this race. Not as good as I would have liked perhaps, but to better my times in all three disciplines is definitely not to be sniffed at, and worth fighting for! The last kilometre was a blur. I was elated from having survived an incredible day with a PB, and to see my friends and parents in the finishing chute, before being presented with my medal by coach Brian, onto whom I duly collapsed! Among the BRATs, every one gave it their best, and most had a good race. A couple were unfortunately pulled out for medical reasons and the heat left it's mark on everyone. I'm told that the conditions on this day were like Hawaii without the wind, and as I walked back to the hotel a little later I saw a thermometer that read 36 degrees centigrade - after 5pm. Rehydration took a couple of days and I know that some of the others were feeling the effects of heat exhaustion for a long while after. Performance of the day definitely goes to Debbie Southwood as she carved more than 2 hours off the course record for her age-group and earned herself a place on the start-line in Kona! Biggest lessons of the day for me - Keep drinking (and taking electrolyte supplements if needed - this is a personal preference and something you'll need to work out for yourself, but the effects of over hydration are just as serious as dehydration), and if your legs are still working, no matter how heavy they feel, resisit the urge to walk or stop, because once you do, it's very hard to get going again.